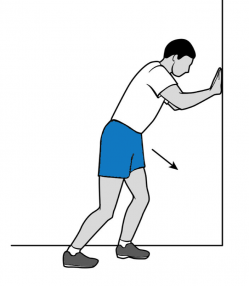 With your unaffected leg forward facing the wall, slightly bend at the knee. The affected leg should be behind you, with the knee bent and the toes slightly pointed inwards. 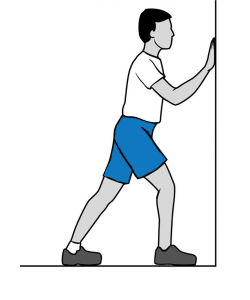 Keeping both the heels flat on the floor, press your hips forward toward the wall. Hold the stretch for 30 seconds. Then relax for 30 seconds. Sit comfortable on a chair with both feet planted on the floor. 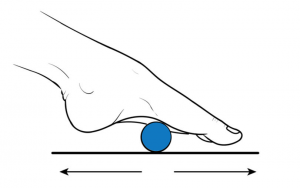 For 2 minutes, roll a golf ball under the arch of your affected foot. Sit on the floor. Both legs should be out in front of you. Loop a towel around the ball of your affected foot and grasp the ends of the towel in your hands. 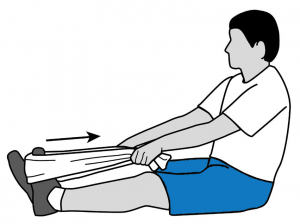 Keeping your affected leg straight, pull the towel toward you. Hold in this position for 30 seconds. Then relax for 30 seconds. Stand straight with your weight evenly distributed over both feet. 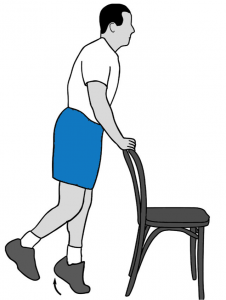 Hold onto the back of a chair or a wall for balance. Lift your unaffected foot away from the floor, so that your complete weight is placed on your affected foot. 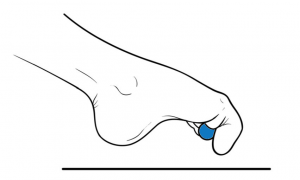 Raise the heel of your affected foot as much as you can, before you lower it. Repeat this about 10 times. Sit down, in such a way that your feet does not touch the floor. Using your foot, write each alphabet in the air. Lead with your big toe. Sit with both feet flat, with 20 marbles placed on the floor in front of you. Using your toes, pick up one marble at a time, and place them into a bowl. Repeat this exercise till you have picked up all the marbles. Sit with both feet flat. Place a small towel on the floor in front of you. 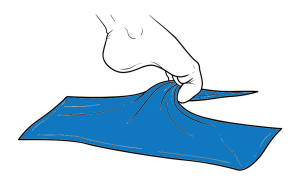 Using your toes, grab the center of the towel, and curl the towel toward you. Relax a bit and repeat it. Sit on the floor. Place your legs straight out in front of you. 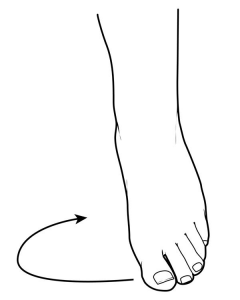 For dorsiflexion, anchor the elastic band on a table leg, then wrap it around your foot. Pull your toes toward you and slowly return to the start position. Repeat 10 times. 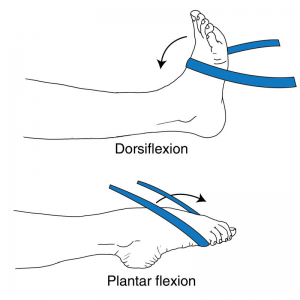 For plantar flexion, wrap the elastic band around your foot and hold the ends in your hand. Slowly return to the start position, gently pointing your toes. Repeat 10 times.